First, a little math. It may be May 7th out here in the real world, but for the folks stuck on the Lost island, it’s still December 21st, 2004. 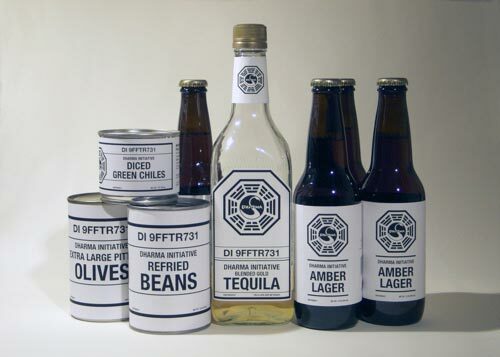 Since time on the island seems to pass at a rate of roughly 30 days per year (about 90 days of island time have passed in 3 seasons of Lost), the losties should be celebrating Cinco de Mayo just around the beginning of Season 8. Huh, looks like the show won’t be running that long. All you need now are some chips, salsa, cheese, guacamole, sour cream, and maybe limes. The labels for the chiles, olives, and beans should fit any standard-canned brand of, uh, chiles, olives, and beans. The tequila label is sized for Jose Cuervo Especial Gold—you can fit the body label on any standard bottle, but the neck label probably won’t work. Finally, the DI Amber Lager is made from Dos Equis Amber. If you have Adobe Illustrator you can mod the PDF and make a pale lager label for Pacifico Clara bottles, but, really, why would you? This entry was posted on Monday, May 7th, 2007 at 1:32 pm	and is filed under Film/Video, Food, Graphic Design. You can follow any responses to this entry through the RSS 2.0 feed. Responses are currently closed, but you can trackback from your own site.